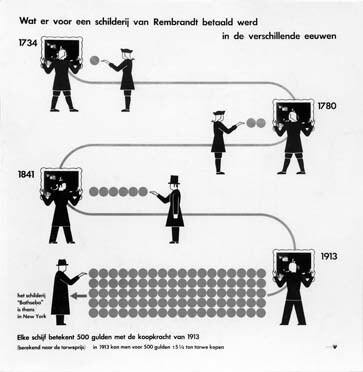 Around Rembrandt (Rondom Rembrandt) was the first Isotype exhibition about art. 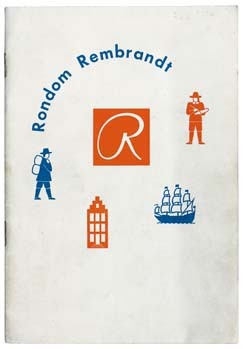 It was innovative in several ways: it did not include original artworks but instead examined the historical background and social context of Rembrandt's work; and it was not housed in a museum or art gallery but instead was shown simultaneously in three branches of a Dutch department store in 1938. 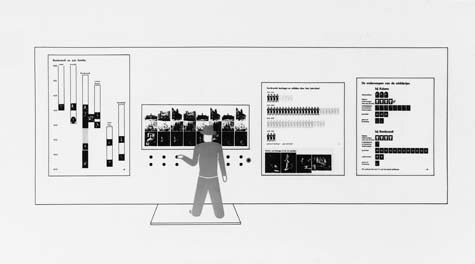 The idea for the exhibition occurred to Marie Neurath when, as a visitor to a major exhibition of Rembrandt's paintings, she was struck by how little had been done to help the public understand them. In Around Rembrandt techniques such as colour coding and interactive apparatuses were employed to make the subject appealing and understandable to the diverse audience found in a department store. 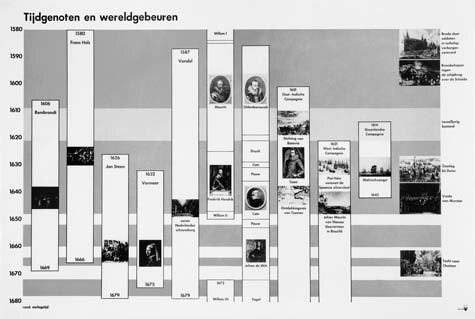 A time chart (upper) places Rembrandt in context with his contemporaries and historical events. The amount of money paid for Rembrandt's painting The Toilet of Bathsheba is shown increasing over the centuries (middle). (Each disc represents 500 guilders with the purchasing power of 1913.) Rembrandt's early and late techniques are compared in photographic details (lower). These columns of grouped buildings, ships and paintings (upper) formed part of an interactive apparatus (lower). Visitors to Around Rembrandt were asked to choose which groups they thought belonged to the same historical period. When a button underneath a column was pushed (as shown in the diagram here) a recording of 'right' or 'wrong' was played. (The right answers are columns 2, 6 and 7). The apparatus represents a pioneering example of a technique that has since become familiar in exhibitions. 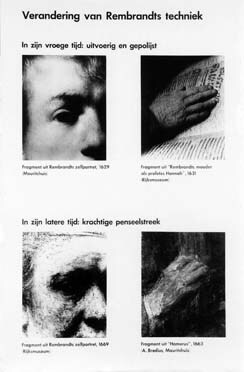 The interior pages show the colour coding used in the exhibition to indicate four different phases in Rembrandt's life. 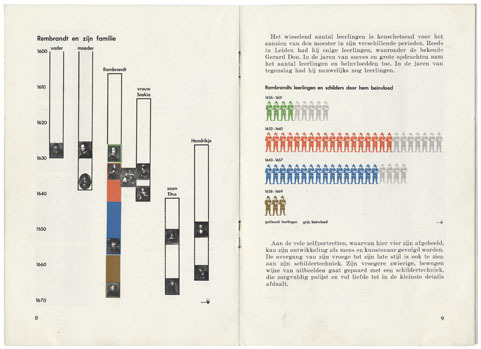 The statistical chart shows the number of his pupils and of painters influenced by him. These increased while he conformed to traditional technique but decreased when he developed a more idiosyncratic style.